Local is a sports pub with "modern, light-filled space serving elevated casual American fare & changing craft brews". 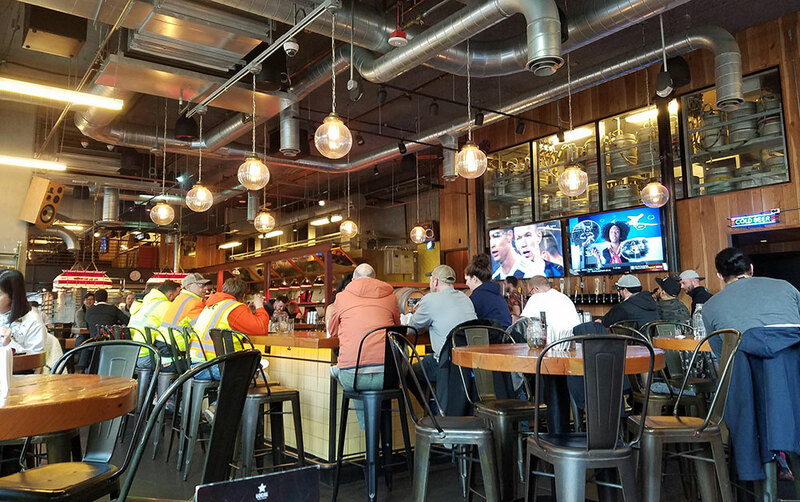 The interior features an open kitchen, large bar, brewing room, and plenty of big screen televisions to watch your favorite team or teams play. It is great for groups or individuals and is usually open seating. 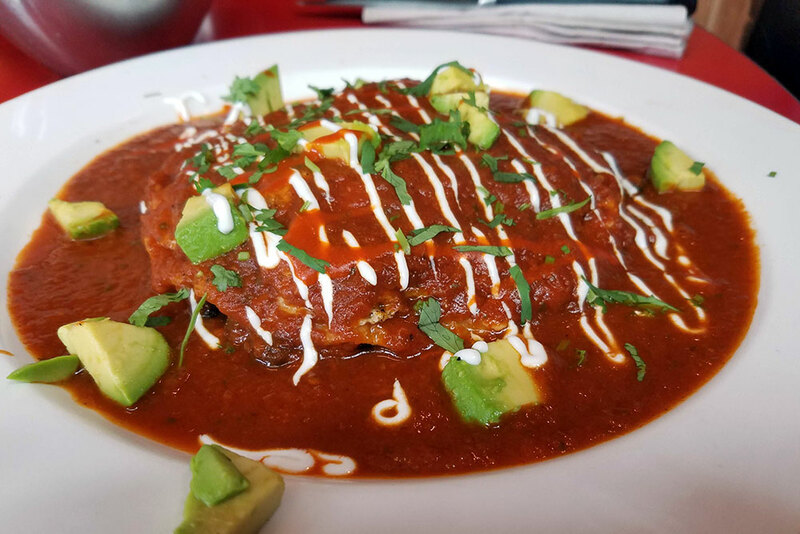 At lunch time during the week, expect it to be packed as it is situated next to one of many Amazon campuses located downtown but don't worry, there isn't usually a wait for a table. There is also a shuffleboard available to play if you're in the mood for some fun. This isn't somewhere I would say is "for kids" since it is a pub, but you could definitely bring your family in for a bite to eat and enjoy yourselves. Service is prompt and friendly when you dine at Local, often seeing the same faces on return visits. I find it quite interesting that when you pay by credit card, as most people do these days, payment is swiped at your table on a little mobile device. This isn't an experience I enjoy during my visits, as I feel rushed to "check out" and figure out the tip quickly in front of the waitress who served me. I have actually brought cash on visits just to avoid this encounter after my meal - I am not a fan! I've eaten here maybe half a dozen times for both weekend brunch and weekday lunch. They have a large, varied menu, including a few vegan offerings so most anyone can find something here they will enjoy. From burgers to fried chicken ramen to huge salads, lunch has options for everyone. 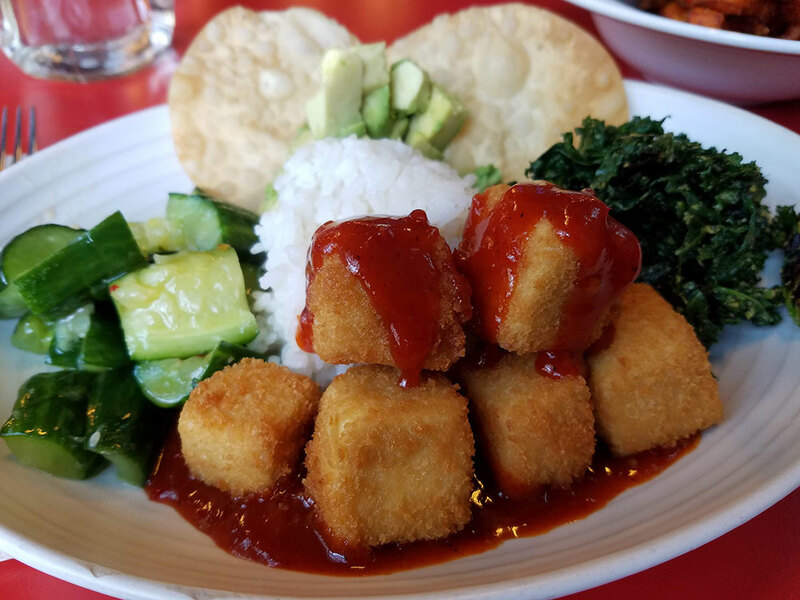 As someone who eats vegan more often than not, I appreciate that this local joint has offerings for vegans and is also willing to "veganize" non-vegan menu items such as their Poke Bowl. 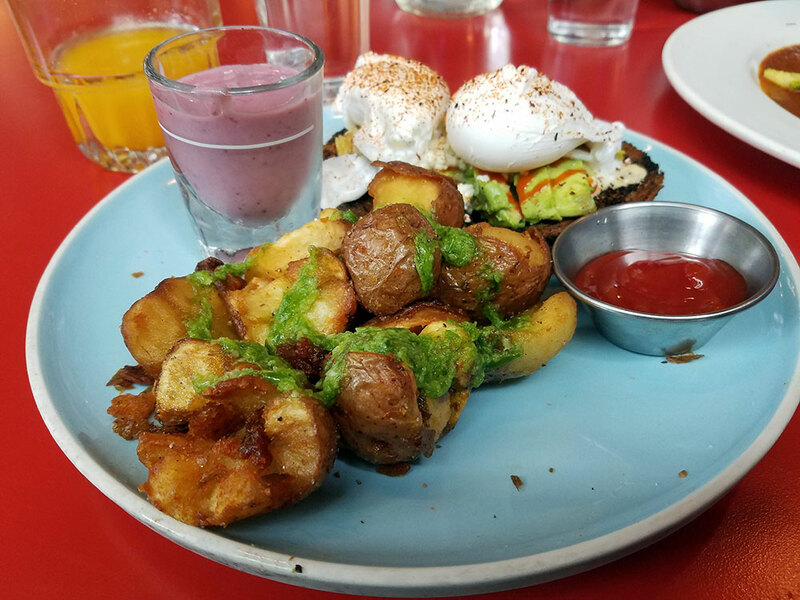 Their brunch menu is fairly limited, with only a handful of choices but their Hippie Toast isn't to be missed. It is avocado toast with roasted potatoes drizzled with a spicy cilantro sauce. You can also opt for eggs to be added to the toast, however, I've had some days where their poached eggs are perfect and then I come back a few weeks later and the poached eggs are extremely overcooked to a hard boil. Occasionally, Hippie Toast also comes with a mixed berry smoothie shooter but this isn't consistent between visits - some days you get one, some days you don't. I love this addition, as I feel it sets this dish apart from other avocado toasts in the neighborhood. And let's face it, you can get avocado toast in some variation at just about every restaurant in the city. That being said, when I come in specifically for this dish you're in for a serious let down when the smoothie shooter doesn't arrive. Consistency is my sole complaint at Local. 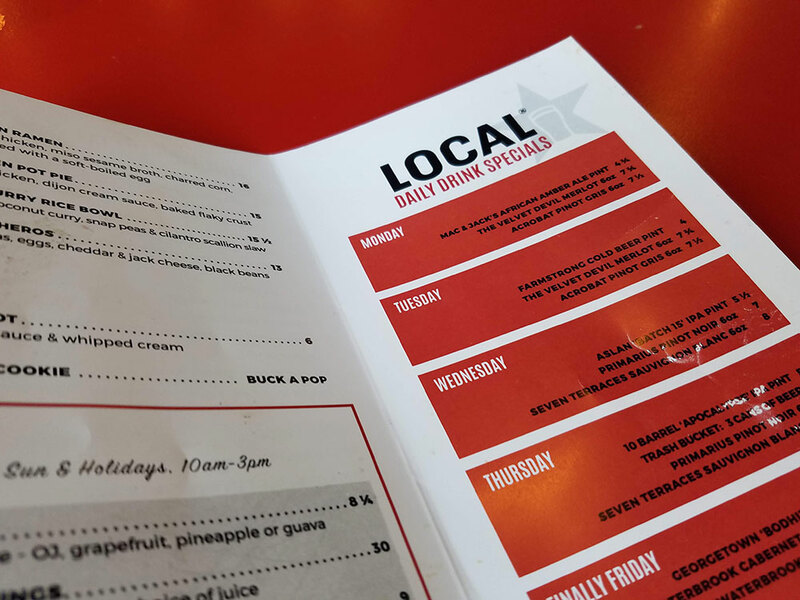 If I order a dish, it should be the same across multiple visits, eggs should be cooked properly, and unfortunately, you can't count on consistency at Local. 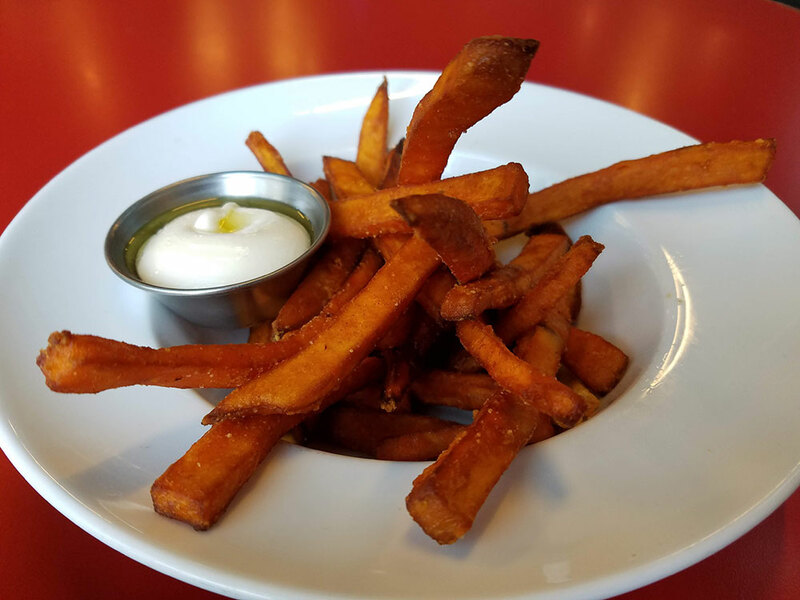 What you can count on is fresh ingredients, awesome breakfast potatoes, and a place to sit without much of a wait on a busy weekend. Want to see more of what the restaurant is like and see what I thought of their Poke Bowl and Sweet Potato Fries? Watch my video below to see my recent visit to Local - dining out as a vegan. If you are interested in drinks, check out their daily drink special which rotates daily. 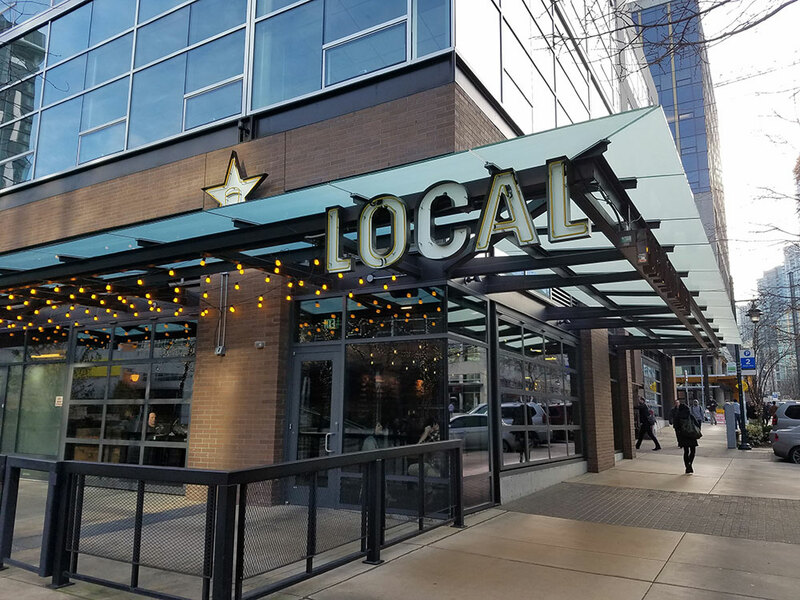 Local is located in the South Lake Union neighborhood of downtown Seattle Washington. Found at 404 Terry Ave N, Seattle, WA 98109.